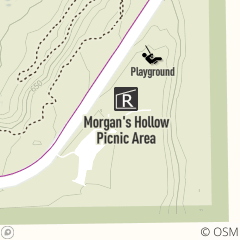 Morgan's Hollow Reserved Picnic Area is located off of Whittlesey Way off of E.49th Street entrance of Ohio & Erie Canal Reservation, south of Grant Avenue in Cuyahoga Heights. Features: large open shelter with electricity, grills, picnic tables, restrooms, ADA accessible, volleyball poles/nets, horseshoe pit, children's play equipment, play field. Availability: Reservable May through October, daily. For reservations or more information, call 216.635.3304 Monday through Friday, 8:30 a.m. -- 4:30 p.m.